One day about a month ago, Chris was driving home from having a nice lunch with Mike. Close to our exit off of Route 18, she saw something very large and white perched in a tree. She called Mike and said, I think I just saw an all white hawk. He suggested she put on warmer clothes and take another drive around to see if she could get pictures. No luck that day. Another day Mike thought he saw it, and it was around the same time in the afternoon on another sunny day. So, one day Chris and Mike went out together on a sunny afternoon specifically looking for this curious specimen. No luck that day either, but we did get chased off by the police for parking along the side of the road. Mike is persistent and dedicated to the mission, so today when we were heading out for the movies, he suggested we bring the camera and make a scan for the hawk since it was sunny and around the same time again. Well, weren't we lucky today! He is likely a leucistic red-tailed hawk. I was on WhatBird Forum this morning and saw you photo posted. I'm glad Mike is persistent, I have never seen a leucistic hawk before...It is simply BEAUTIFUL!! Amazing photos. Did you take the photo near Rutgers Busch campus? 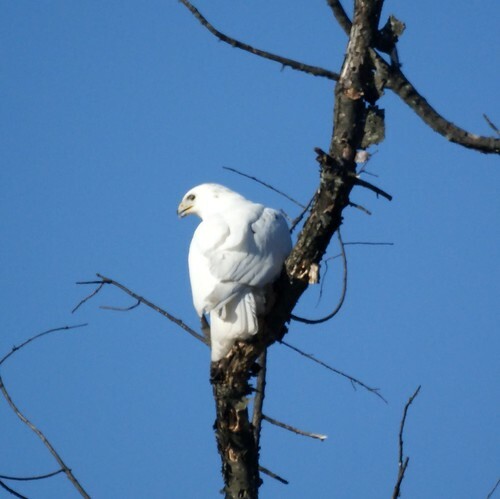 I saw this "white hawk" more than 10 times in summer (2009) when I drove from Rt.18 into Rutgers Busch campus. ps. it is great knowing this NJ bird blog. Would it be unusual to see these hawks near exit 13 on the Garden State Parkway? For the past 2 weeks I've seen these guys! I've been telling my husband about them nearly every day when driving down the parkway to school. That's a gorgeous bird - pretty cool thing to see. 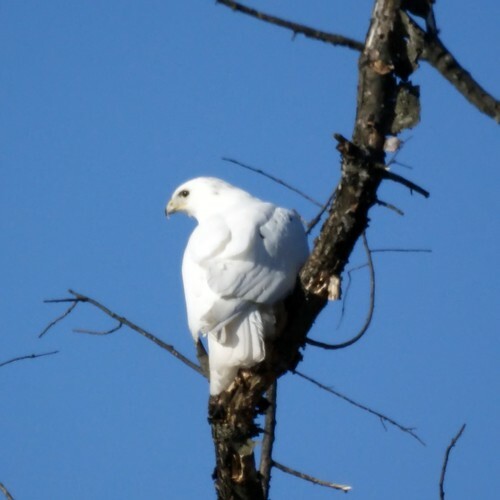 Yesterday, I saw a white hawk when exiting Rt 18 to Busch Campus, Rutgers! Awesome. It landed in a tree next to the road. This hawk is still out there--I got a good look at him/her some time last month! Thanks for letting us know. We are glad he is still around.